This product is excellent and as it does everything it states no other product is necessary. Have a lot more space in my cupboard now that I only need one product. Developed specifically for use in commercial businesses, this Flash Multi Surface and Glass Spray is a highly effective formulation for busy environments. Boasting a build-in deodorising function which leaves behind a fresh scent, each spray gets to work instantly on mirrors, shower screens, table tops and windows. Designed entirely for this purpose, it leaves a completely streak-free shine while the powerful disinfecting properties kill 99.9% of bacteria within 3 minute of contact. 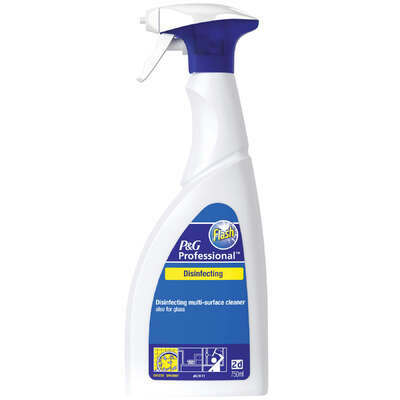 Supplied in a handy ergonomic bottle with an easily functioned push nozzle spray, this reliable glass spray product slips easily into your existing routines. Our Janitorial Supplies category has everything your business needs from Cleaning Cloths and Polish through to Antibacterial Foaming Spray - all available at exceptional wholesale prices.